Eulerian Technologies | DMP & PROGRAMMATIC PLATFORM: How does Photobox reach its audiences? Data activation for media customization purposes: As the European leader of personalized photo products, offering their clients more than 600 references – albums, calendars, printing -, Photobox puts its data at the center of their marketing strategy in order to achieve the following goals: – Make use of all the interaction between a user and a brand for media purposes. – Use of 2nd-party data to feed their marketing campaigns with information coming from a website on maternity and early childhood. – Campaign contextualization and customization. – Improvement and enhancement of the knowledge on their clients. The partnership between Eulerian Technologies and Tradelab started as an answer to Photobox’s need for a 100% data-driven strategy. 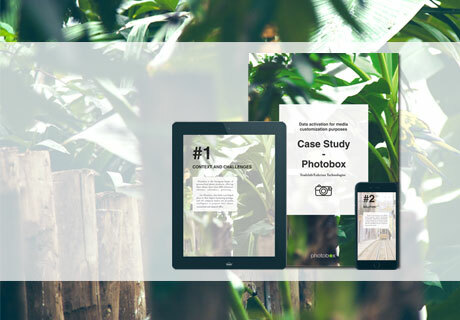 To discover how Eulerian’s DMP and Tradelab’s programmatic platform helped Photobox to achieve its objectives, click here.